Angela Welch is a Digital Marketing Strategist during the week and a freelancer by the weekend. Between building relationships with local businesses to help them execute their marketing goals, to managing AdWords campaigns and creating SEO strategies – she doesn’t stop there: Angela is a passionate cake decorator. From creating seven-layer cakes to paring new flavors, she’s a talented patisserie. You’re probably querying how she manages a 9-5 office job with her skill making cakes – this is a common question. Remember the saying “keep a work-life balance?” Well, this is what she considers a balance: expanding her digital marketing career during the week to endorse her artistic side. Angela learned from exquisite pastry chefs during college, pursuing a point in her career when she realized she could start her own venture. 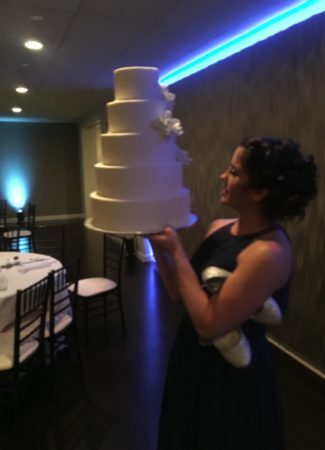 But, as more and more ‘bridezilla’ patrons demanded high-maintenance requests, she realized making cakes for a living would eventually diminish the true enthusiasm and love that goes into creating a cake. And, let’s not forget the more ironic part of this story: she doesn’t fancy sweets. Odd, right? Angela works seven days a week among her Monday-Friday job, helping Livingston Farm part-time with their website marketing, making the occasional cake and taking online classes – she is a passionate go-getter. If you need advice on how to improve your online presence, looking for a new recipe to try or simply want to connect – Angela would love to hear from you.